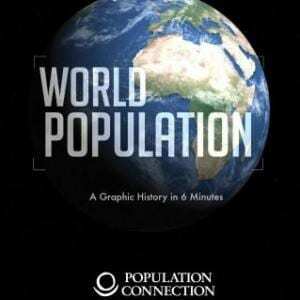 Educators agree that Population Education’s video, World Population is the best-ever graphic simulation of human population growth. As the years roll by on a digital clock from 1 C.E. to 2050, dots light up on an illustrated map to represent millions of people added to the population. Historic references on the screen place population changes in context. The full video runs in under 6 minutes. Language tracks included English, Spanish, French, Arabic, Hindi, Mandarin, and English closed captions. The animated “million-people dots” film illustrating the growth of population through history was so popular that I froze certain individual frames so that I could stop and talk about specific areas of population growth trends. World Population is powerful in its simplicity and a wonderful discussion starter on one of the greatest challenges facing us in this new century. I recommend it to students, teachers and policy-makers. The impact of this short video is astounding. It is appropriate for both social and biological sciences, and will be an asset to any school’s audio-visual library.